The perfect trip for those wishing to experience a short trek through the magnificent Annapurna mountain range in Nepal while staying in relative luxury. Ker and Downey's famously comfortable and characterful lodges enjoy spectacular mountain vistas and offer comfortable beds and ensuite bathrooms with hot running water. Enjoy complimentary drinks during the nightly happy hour and share your day's adventures around the lodge's cosy fireplace. Kathmandu - Explore the fascinating temples and bazaars of this ancient city. Kathmandu is a frantic and beautiful ancient city which dates back to 12AD. Now home to 4 million mostly Hindu and Buddhist people it is a feast for all the senses. From the moment you step off the plane you will be dazzled by a kaleidoscope of colours, scents and noises. Today is free to relax after your journey or to start your explorations of the capital. country and a destination for Buddhist pilgrims from all over Nepal. After breakfast, we leave the Kathmandu Valley behind and drive to Pokhara, a journey of around 6 hours. We'll stop for lunch at a typical Nepali roadside cafe along the way. Pokhara is smaller and more relaxed than Kathmandu and is beautifully situated on the banks of Lake Phewa from where, on a clear day, there are superb views of the snowcapped Annapurna range, including Machhapuchhre - the famous 'Fishtail' mountain. In the afternoon there will be a briefing by your tour leader to give you an idea of what to expect on a day to day basis while on trek and to make sure that everyone is properly equipped. This morning we depart Pokhara by road, it's about an hour drive to the point where the trek starts. Our walk will follow a ridgeline in the lower foothills of the Annapurna with surrounding views of the Pokhara Valley. We plan to enjoy a picnic lunch with a view along the way. The route then drops to follow the Modi River Valley where the first of our comfortable Ker and Downey lodges, Sanctuary Lodge, is located. The lodge was constructed in the traditional mountain style by local artisans and has a beautiful garden where you can enjoy magnificent views of the sacred and unclimbed peak Machhapuchhre, or Fishtail Mountain as it's more commonly known because of its shape like a fish's tail. Find out more about all of the Ker and Downey Lodges used on this trip at https://keranddowneynepal.com/lodges. 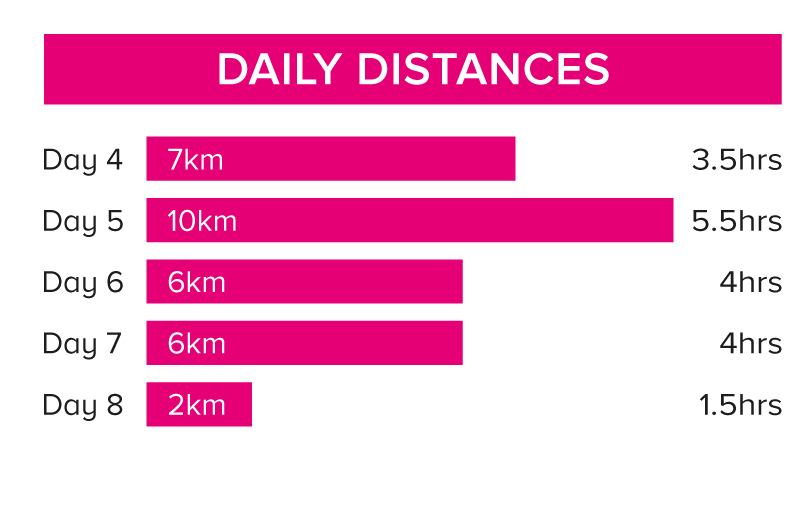 Today's seven kilometre walk is expected to take around three-and-a-half hours with a total descent of 460 metres. After breakfast, we leave the lodge walking out through the outlying farms following the Modi River Valley. Soon we begin to climb out of the valley and up towards the mountains. The trail passes through small hamlets, terraced rice fields and forests with spectacular views of the surrounding valley. Snacks are provided along the trail and a hot lunch is served on arrival at the lodge in the early afternoon. Himalaya Lodge affords magnificent close-up views of the surrounding Annapurna mountain range. It also overlooks the settlement of Ghandruk with its whitewashed, stone tiled houses clustered closely together on the valley side. Populated by the Gurung ethnic group, Ghandruk is a popular recruitment location for the Gurkha soldier regiment of the British Army. Today's 10 kilometre walk is expected to take around five-and-a-half hours with a total ascent of 850 metres. We wake up this morning tea and enjoy coffee served in the garden and watch the sunrise over some of the highest peaks on the planet - Annapurna South, Annapurna 1, Hiunchuli, Gangapurna, and the Fishtail. After a relaxing breakfast and the glorious views from the Himalaya Lodge, we start our trek to Landruk. After leaving the village of Ghandruk, the trail descends steeply to the banks of the Modi River. We reach the base of the cliffs where the famed honey hunters of Nepal climb up on ropes to collect the honey from bees' nests on the cliff side. We then cross a strong suspension bridge to the opposite banks of the Modi. From here is it about an hour trek up switchbacks and steps to reach the Gurung village of Landruk which enjoys glorious views of the Annapurna range. La Bee Lodge is small and intimate, with only 12 en-suite rooms and is exquisitely perched on a cliff edge with awesome views stretching far into the distance. After lunch on arrival, we will set out in the afternoon to explore the village and surrounding area on a guided walk. Today's six kilometre walk is expected to take around four hours with a total ascent of 315 metres and descent of 750 metres. After breakfast, we leave the Bee Lodge and trek to our final Ker and Downey lodge of the holiday, Gurung Lodge situated close by the village of Majgaun. Today's trek contours the hillside, with small ups and downs, passing through villages and farmland. We reach the Lodge in time for lunch with the option to join an afternoon hike through the surrounding villages. Gurung Lodge has been built in the style of a typical timber and stone tribal house, set in lovely gardens with 11 en-suite rooms, a beautiful lounge and dining area with exposed wooden roof beams. Today's six kilometre walk is expected to take around four hours with a total ascent of 135 metres and descent of 300 metres. After breakfast, we set off along the ridge and descend through the wooded hillside and terraced farmland to the valley floor where we meet the road and our trek ends. Driving back to Pokhara we plan to stop at Tashiling, a thriving village of Tibetan refugees with its own schools and monastery, where you can watch Tibetan carpets being made. On arrival back in Pokhara the afternoon is free to relax. You can hire a boat and spend time on the lake or explore the lakeside area where many of the souvenir and clothing shops are located. Pokhara also has a great choice of cafes and restaurants serving hungry trekkers all types of cuisine from around the world! Today's two kilometre walk is expected to take around one-and-a-half hours with a total ascent of 210 metres. Our trip ends today in Kathmandu. While you are trekking, daytime temperatures will generally be warm. On this trek you do not go above 2500m, so although you will need a sweater or fleece for the evenings, weather will generally be mild. However it can be chilly in the evenings, particularly between November and February. Note that down jackets, fleece hats and gloves are provided at the trekking lodges for your comfort. Gloves and warm hat - Useful in the morning and in the evening in the winter months. Trek Kitbag: Customers on all of our treks in Nepal receive a free Explore kitbag on the tour prior to the start of the trek. Approximately 80 litres in size it's ideal for all items you need to take on trek and the luggage preferred by our porters. The weight limit for this is 10kg but you will probably find that you do not need this much. Daysac/Rucksack: 30-35 litres recommended. During the course of a trekking day, you do not have access to the luggage which is being carried for you by the porters. In any mountain region the weather can change rapidly and you must be equipped for this eventuality. Your daysac should therefore be large enough to carry waterproofs, fleece jacketweater, long trousers (if walking in shorts), sun hat, sun cream, water bottle (minimum 1 litre) and your camera. Most people normally find that this adds up to about 2 to 3kg. We advise you to take a waterproof rucksack cover or alternatively line the sack with a large plastic bag to keep the contents dry. Advice on how and what to pack for the trek will be given at the tour briefing. Water Bottle - Large water bottle (preferably 2 litre). For environmental reasons, we do not encourage the purchase of bottled mineral water. The lodges provide filtered and boiled water and we recommened taking a bottle with in-built filter such as the Water-to-Go system www.watertogo.eu. Toiletries - Try to keep heavy cosmetics etc to a minimum. Towels, shampoo and soap are provided in the lodges. Ear Plugs- some may find it more comfortable to bring ear plugs with them so that while in hotels and lodges they are not disturbed at night. Almost every item required for a trek can be purchased or hired in Kathmandu and your Tour Leader can advise on the best shops to visit at your tour briefing. Although entirely voluntary, tipping is a recognized part of life in this region of the world. Some local staff look to members of the group for personal recognition of particular services provided. Accordingly you should allow approximately £40 for gratuities for local staff. In order to make things easier for you, the Leader may organise a group's tips kitty and if this is the case, they will account for it throughout the tour. On the trek you will be staying in Ker and Downey lodges which have all been purpose-built to allow guests to experience some of the most spectactular mountain vistas in the world in comfort. You will be staying in ensuite rooms with comfortable beds with sheets, blankets and down pillows. Towels, shampoo and soap are included and hot water bottles are also provided each night. Down jackets, fleeces, hats and gloves are available at each lodge for your convenience. There is a happy hour every night between 6 and 7pm where local alcoholic beverages including beer and spirits together with snacks are served free of charge around our central fireplaces which burn recycled briquettes. For more information and images see https://keranddowneynepal.com/lodges. The Kasara Jungle Resort is located on the fringes of bio-diversity-rich Chitwan National Park. The essence of Kasara's design is a blend of simple luxury in a lush and natural jungle environment. Guests are accommodated in spacious air-conditioned rooms, each with a private water-garden courtyard and indoor-outdoor bathroom space. There's a large garden area and outdoor swimming pool. Surrounded by lush gardens, the Shangri-La hotel Kathmandu is an oasis of green in the heart of the city. Facilities include an outdoor swimming pool, spa and well-equipped fitness centre. The comfortable well-appointed spacious rooms are furnished in a contemporary style. Nepal: An entry visa is required by UK, New Zealand, Australian, US & Canadian citizens and can be obtained on arrival at Kathmandu Airport and various international border crossings between Nepal and its neighbouring countries. This currently costs 25 USD for a 15 day visa, and 40USD for a 30 day visa. All visas are issued as multiple entry visas and are valid from the date they are issued. A passport-sized photograph for immigration is required. Payment must be made in cash, UK sterling and US dollars are both accepted. 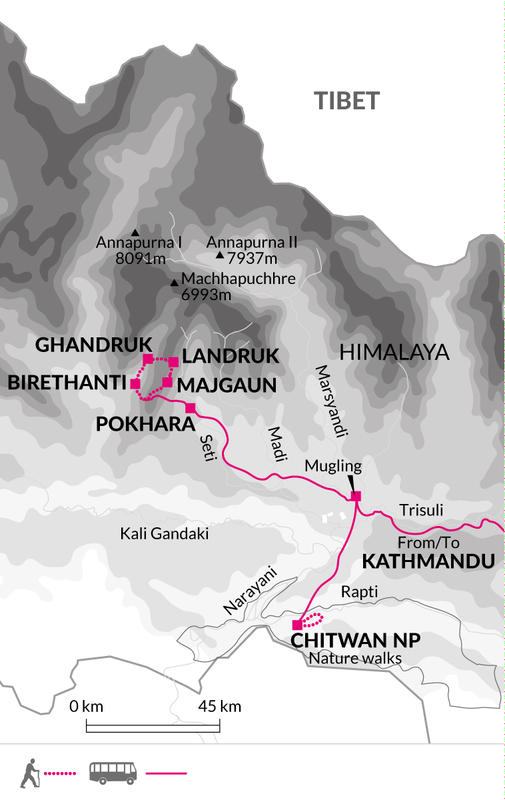 Trek on 5 days for between 1.5 to 6 hours. Walking is at low altitude throughout on well-marked and maintained mountain trails with some ascents and descents on stone steps.